You would only be looking to get a water softener if you live in an area that has hard water. 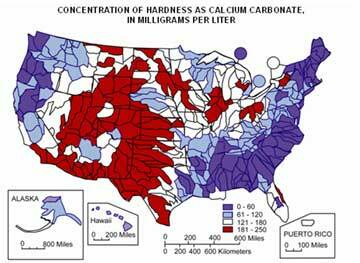 Below is an image from the U.S. Geological Survey showing the water hardiness levels throughout the United States. This image is originally found on their page on Water Hardness and Alkalinity. Here in Georgia, we are fortunate that the majority of the state has the lowest levels of hard water found in the United States. However, we do have a lot of red clay and you may notice those red stains showing up in your shower head, shower floor, around your sink drains, etc. A water softener combined with an aerator will work to greatly reduce that. Water is labeled as "hard" when the most common minerals found in the water are calcium and magnesium. This generally is due to the types of minerals, rocks and metals that are found in the ground. So, how then does a water softener work to reduce the calcium and magnesium in the water? "Ion exchange is an exchange of ions between two electrolytes or between an electrolyte solution and a complex. In most cases the term is used to denote the processes of purification, separation, and decontamination of aqueous and other ion-containing solutions with solid polymeric or mineralic 'ion exchangers'." So basically, it's the process of "cleaning" the water of these minerals and the water softener then replaces them with sodium ions. If you remember your high school chemistry, ions are either atoms or molecules that carry a positive charge or a negative charge. Although calcium and magnesium and sodium all carry a positive charge, sodium is the weakest and is suitable to be used as a replacement ion. Here's a short video from NaturalSof, LLC on how water softeners work. There are many benefits related to using a water softener. Here are 11 of the most common benefits. Whether you wash your clothes by hand or in a washing machine, they will be softer. Your fabrics and clothes will last longer. Your white fabrics and clothing will stay whiter for much longer. Your skin and hair will be cleaner and smoother. For people with sensitive skin, hard water can cause problems. The water softener can alleviate those issues. Everything coming out of the dishwasher will be shinier and cleaner. You will also save money on repair and maintenance to your appliances. You won't have to buy and use as much skin lotion. You won't have to buy and use cleaners to get rid of hard water stains. Adding a water softener to your home only increases the overall value of your home. (Great for resale). Overall, the cost of a water softener can outweigh the benefits depending on how long you plan to stay in the home and how important some of these benefits listed above are to you. If you've lived in a part of the country that has hard water then you know the difficulties that can be associated with dealing with that on a daily basis. There are many different types of water softeners. We recommend you contact your local plumber (like the folks here in Georgia at Atlantis Plumbing) for information on what system would work best for you and your home. Is A Water Softener Good For Your Skin? Absolutely yes! Water softener systems are wonderful for skin, especially if you have sensitive skin, if you suffer from acne and/or breakouts. Hard water can leave skin dry but with such a high concentration of minerals, it can also end up clogging pores, causing skin to flake and/or itch. How do you rinse off all those minerals if all you are using is hard water? The answer is to use distilled water (yep, from a bottle) but that gets pretty expensive after a while. Softer Skin - because the concentration of calcium and magnesium are greatly reduced in soft water your skin won't have a buildup of those minerals (which tend to make the skin dry). Soft water truly rinses your skin much cleaner than hard water. Clearer Skin - all those minerals in hard water can clog your pores, cause breakouts, acne and if your skin gets dry enough you may end up with some eczema and other dry skin problems. Soft water can help to give you some relief from all of that. Silky and Smooth Hair - your skin is not the only beneficiary of soft water. Your hair and scalp are too. You can help to relieve your scalp of that itchy, dry feeling and you will be able to rinse the shampoo build-up from your hair giving your hair the chance to be as beautiful as it should be. Is Drinking Soft Water Bad For Your Health? "Regular tap water contains very little sodium. The amount of sodium a water softener adds to tap water depends on the “hardness” of the water. Hard water contains large amounts of calcium and magnesium. Some water-softening systems replace calcium and magnesium ions with sodium ions. The higher the concentration of calcium and magnesium, the more sodium needed to soften the water. Even so, the added sodium doesn’t add up to much. In any case, it’s important to keep in mind that the majority of sodium in an average person’s diet comes from table salt and processed foods. Thus, the best way to decrease sodium in your diet is by putting away the saltshaker and cutting back on processed foods." If you have any questions about water softeners, call Atlantis Plumbing today at 770-505-8570. We are available 24 hours a day, 7 days a week.